As heavy metal devotees may have noticed of late, rising progressive metal band ONI has been gearing up for something big. Today, the band is pleased to reveal the news of their recent signing with Blacklight Media/Metal Blade Records. 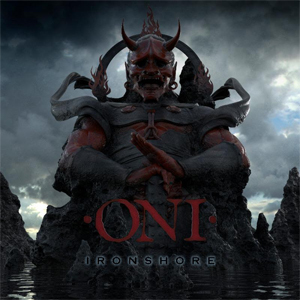 The label will unleash ONI's progressive metal opus, Ironshore, on Black Friday, November 25th. Pre-orders will become available in early October. Blacklight Media is a new label launched this past February by Chris Santos, executive chef and managing partner of the New York City restaurants VANDAL, The Stanton Social and Beauty & Essex, in partnership with Metal Blade Records CEO/founder Brian Slagel. Santos states, "One of the things that I think will make Blacklight Media a label to watch for years to come is the diversity of our roster. ONI is our first crushingly heavy signing that matches their heaviness with incredible progressive precision and classically brutal breakdowns. I'm very excited to have them as part of the Blacklight Media family!" Vocalist Jake Oni adds, "We are excited to announce our signing with Blacklight Media/Metal Blade Records. It is an honor to be on the same roster as so many amazing bands. With the support of this legendary label at our side, the world is ours!" Formed in 2014, the initial vision for ONI was, "to be the band I never got to see", explains Jake Oni. With their influences rooted in progressive metal, ONI's sound can be compared to the genre's heavy hitters - THE HUMAN ABSTRACT, PROTEST THE HERO and BETWEEN THE BURIED AND ME - yet they remain truly unique. With Jake Oni handling vocal duties, Martin Andres and Brandon White on guitar, Chase Bryant on bass and Joe Greulich on drums, they are also perhaps the first metal band to feature a Xylo-synth player, in the form of Johnny D, which adds an intriguing dynamic to the nine tracks found on Ironshore. ONI has now set their sights on conquering the music world, one show at a time. After their upcoming performance at this year's Knotfest (which will feature a special guest appearance by LAMB OF GOD vocalist Randy Blythe during their 11:55am-12:25pm set on the Nuclear Blast stage), the band will join up with Max & Iggor Cavalera's Return To Roots tour and perform on select dates through October 21st. Following that tour, ONI will join the "I Worship Chaos" Tour line-up, beginning November 23rd and featuring headliners CHILDREN OF BODOM and fellow special guests ABBATH and EXMORTUS (the latter of which they will perform five off dates with prior).